IMPORTANT – half board compulsory from 25.05. to 28.09.
the tourist (and very close) centre of Porto Cesareo. Le Dune Suite Hotel is located a few steps from the sea and from a white sandy beach from which it takes its name. Porto Cesareo is the town that hosts the hotel, on the Ionian coast of Salento, in the province of Lecce. 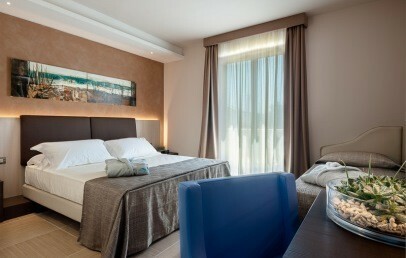 Le Dune Suite Hotel is 65 km away from Brindisi Airport and about 30 km from Lecce and Gallipoli. Recently built, the 4-star Hotel Le Dune Suite features a design style, high quality materials and refined details that combine modernity and tradition. The main building presents a spacious and welcoming hall with panoramic windows and lounge terraces. In the ground floor you find the spa, while in the first floor there is a solarium with outdoor pool and the American Bar. Le Dune Suite consists of 48 rooms, placed in the ground and first floor, 3 restaurants, a reading room and a playground area for young guests. 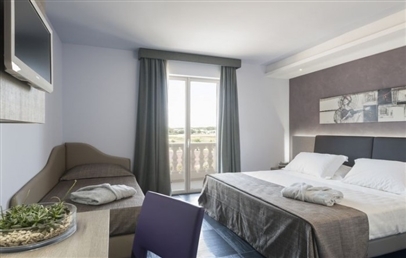 The 48 rooms of Le Dune Suite Hotel are modern and characterized by a dynamic and smart design. 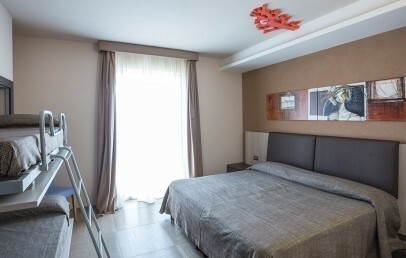 They feature natural colors and are all equipped with air conditioning, minibar, LCD TV, desk, safety box, comfortable king-size beds, free Wi-fi connection, private terrace. The "Le Dune" beach is a fine sandy beach with shallow water. It is located in front of the hotel and it offers sun umbrellas, sunbeds, mini club for the children and animation program for the adults. The costs for the beach service for 1 umbrella + 2 loungers for June € 18, July € 24, August € 32, September € 18 (until September 21th) valid for all guests. The supplement for the first row is € 70 per week. All guests booked in the Suite are entitled of the first row, paying only the cost for the beach service (upon availability and request). Prices subject to change. The Private Spa Le Dune, unique in the area of Porto Cesareo, offers both traditional and modern treatments. It consists of different treatment and massage rooms, sauna, Turkish bath, emotional showers, ice fountain, whirlpool tub and tea corner. The "Granchietto Club" is dedicated to children 4 to 12 y.o. and offers a wide program of fun psychomotor activities, entertainment, music and dances, included in the price. For your lunch and dinner time, the hotel offers a wide range of locations and menu. Le Dune Suite Hotel Restaurant is located on the ground floor. It offers a refined and modern atmosphere and the typical Salento cuisine with a pinch of creativity inspired by seasonal ingredients. On the terrace just a few steps from the beach, there is the Aqua Restaurant. It offers an informal and friendly atmosphere, aperitifs and à la carte menu in the evening, light lunches, cocktails and fresh fruit. The American Bar offers a wide selection of coffee, cocktails, gastronomic events with appetizer and finger food accompanied with best wines and good music. IMPORTANT – The half board is compulsory from May 25th to September 28nd. The half board supplement has to be paid on spot. Le Dune Suite Hotel offers a 24/24 concierge services, car park and several additional facilities are available on request or the staff will be glad to organize any nice tours or excursions. The Deluxe rooms are cozy and relaxing and features refined material and furniture. They present a Sommier king-big-size bed (200x200), a closet with a digital safe integrated and a large en-suite bathroom with shower and hairdryer. 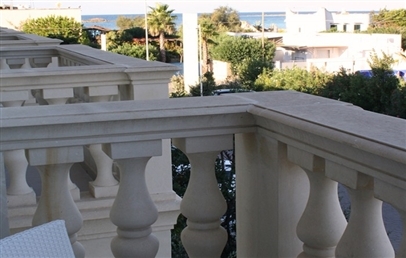 The Deluxe rooms have a small terrace with lateral sea view. The Suite features care details and a warm and welcoming atmosphere. It presents a modern and elegant furniture and consists of a living area (no door) with sofa and armchair and a bedroom with a circular king-big-size bed (200x200). The bathroom has a Jacuzzi tub. The Suite overlooks a terrace in l-form. The Superior rooms are distinguished by soft colors and elegant style. They offer a Sommier king-size bed (180x200) and, on request a single sofa bed or a comfortable bunk bed ideal for families. 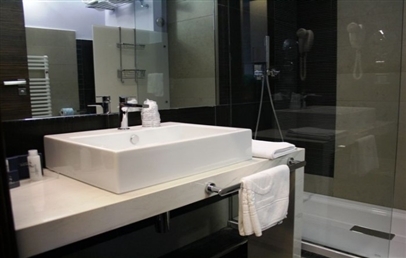 All rooms present modern facilities and the large en-suite bathroom has a shower. The Superior rooms have a private terrace. Baby cot for the child up to 3 years old to be paid locally (facultative): € 15,00 per day. Half Board (dinner) compulsory from May, 26th to September, 28th to be paid on site. Adults: € 30,00 per day; children (3-8 years old): € 19,00 per day. Drinks not included.